In 2010, Jupiter came closest to Earth on September 20 – yesterday – at 21 hours Universal Time (4 p.m. Central Daylight Time). Then Jupiter was only 368 million miles away. Today Earth passes between the sun and Jupiter, placing Jupiter opposite the sun in our sky. Astronomers call this event an opposition of Jupiter. The 2010 opposition is Jupiter’s closest since 1963. 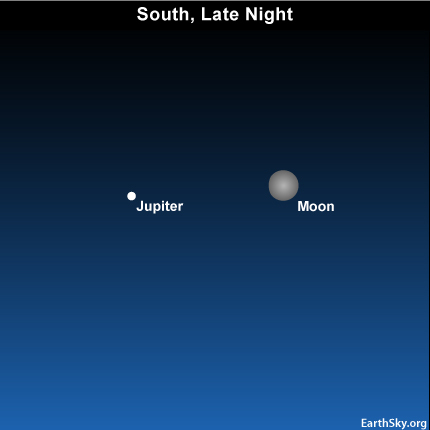 In addition, Jupiter is near tonight’s moon. The giant planet is now lighting up the September night from dusk until dawn. It will remain close and bright throughout the second half of September. Although it will dim slightly by October, more people will notice Jupiter next month, because it will appear in the east already as the sun is setting in the west. Why is Jupiter closer at some oppositions than others? It is because Jupiter’s orbit – like Earth’s orbit – is not perfectly round. Jupiter happens to be near its closest point to the sun in its 12-year orbit around the sun. That closest Jupiter-sun distance will come in March 2011. We are passing between Jupiter and the sun – so Jupiter is closer to us than usual at this year’s opposition. Jupiter will not come this close to Earth again until the year 2022. Jupiter comes to opposition every 13 or so months, as Earth takes this long to travel once around the sun relative to Jupiter. Jupiter’s closest approach to Earth for the year always falls on or near this planet’s opposition date. In 2010, Jupiter came nearest to Earth on September 20, at 21 hours Universal Time (3 p.m. Mountain Daylight Time). However, Earth flies in between the sun and Jupiter today at 12:00 Universal Time. That is 6 a.m. Mountain Daylight Time on September 21. When it is opposite the sun, astronomers say that Jupiter is in opposition. The king planet now rises in the east at sunset, and sets in the west at sunrise. At midnight, Jupiter climbs highest in the sky, and because it is opposite the sun around now, you can see Jupiter at any time of night. For example – as today’s chart shows – you can see it in the south at midnight tonight, when the sun is below your feet. At dawn tomorrow, you will see Jupiter low in your western sky. At opposition, Jupiter shines at its brightest in our sky. You would need at least 80 Jupiters – rolled into a ball – to be hot enough inside for thermonuclear reactions to ignite. In other words, Jupiter is not massive enough to shine as stars do. However, Jupiter is the largest planet in our solar system. So, when the sun goes down on these September 2010 nights, you might – if you are fanciful enough – imagine bright Jupiter as a tiny sun all night long. Jupiter’s greatest distance from us will come when Jupiter is behind the sun from Earth in April 2011. Let us see . . . closest in late September . . . farthest a bit more than six months later in early April 2011. You might see that Jupiter’s distance from us, as well as its location in our sky, is being driven primarily by Earth’s year-long orbit around the sun. That is because Earth travels around the sun in an orbit that is closer to the sun than Jupiter. Our orbit is smaller, and we move faster in orbit than does the solar system’s king planet. Earth travels at a speed of about 18 miles per second in orbit, in contrast to about 8 miles per second for Jupiter. Be sure to look for Jupiter near the moon tonight. They will be beautiful on this night of Jupiter’s opposition. And remember, this September 2010 opposition of Jupiter counts as extra special – Earth’s closest encounter with Jupiter since the year 1963! Site contents copyright © 2019 Recorder Online	except as noted. All rights reserved. | 88 queries in 2.302 seconds.